For skateboarders across the world, Skate 3 was our way of still skateboarding when we couldn’t. When we were injured, rained out, or laying wrecked from an entire day of street skating; Skate 3 provided us a way of learning how to skate again, it provided us with an avenue of progress and exploration. Skate 3 enriched our experience as skateboarders, so it has come as no surprise skateboarders passionately demand the release of Skate 4. We’ve decided enough is enough. It’s time to Make EA Skate Again! Here at The Berrics, we’ve always prided ourselves on being a bridge for skateboarders to access your favorite pros, and moreover, to guard that bridge as representatives of skateboarding to any industry attempting to cross. We ask you to cross the bridge to take EA head on, as we stand to echo the voice of the people. What do we want? Skate 4! When do we want it? Now! 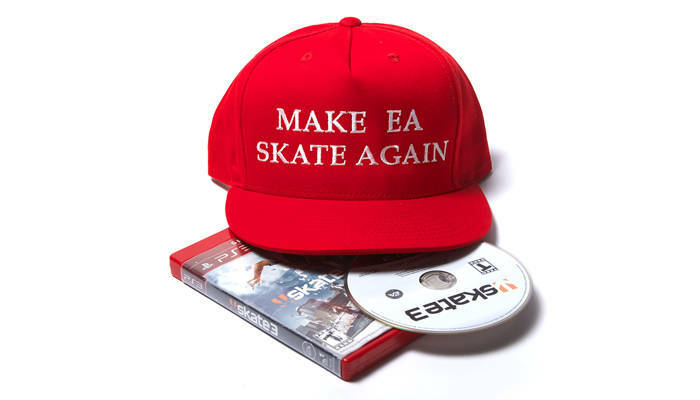 Make EA Skate Again! Over these past six years you have proven it is your endeavor to never surrender, so then, we promise that neither shall we. Together we can make it happen. We ask you to join the movement, to echo our declaration against the nonexistence of Skate 4. Together as skateboarders, we believe we can accomplish anything. We just have to commit to rolling away no matter the cost. So join us, because together it is up to us to Make EA Skate Again. Follow @MAKEeaSKATEAGAIN for updates on our campaign.